Hurricane Edouard near peak intensity. Hurricane Edouard was the strongest hurricane in the 1996 Atlantic hurricane season, reaching winds of 145 mph (230 km/h) on its path. Edouard remained a major hurricane for eight days, an unusually long amount of time. A Cape Verde-type hurricane, the storm formed near the coast of Africa in the middle of August. It moved westward then curved northward, and persisted until early September when it became extratropical to the southeast of New England. Edouard, originally forecasted to strike the northeast United States, produced hurricane force gusts to portions of southeastern Massachusetts while remaining offshore. The winds caused minor damage totaling to $4.25 million (2005 USD). In addition, the hurricane generated strong waves and rip currents to coastlines, killing two people in New Jersey and causing numerous injuries. A tropical wave moved off the coast of Africa on August 19, accompanied with spiral bands of convection around an area of low pressure. A large circulation quickly developed once it reached the Atlantic Ocean, and the system organized into Tropical Depression Four late on the 19th while located 345 miles (555 km) southeast of the Cape Verde Islands. Initial forecasts predicted for great intensification, including one forecast for the depression to strengthen to a hurricane within three days. However, the depression remained disorganized, and slowly intensified to attain tropical storm status on August 22. After becoming a tropical storm, Edouard quickly strengthened due to the establishment of an upper-level anticyclone over the storm. The storm moved to the west in response to a strong subtropical ridge to its north, and Edouard strengthened into a hurricane on August 23. 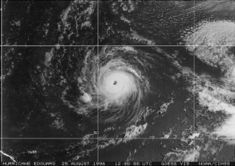 Due to very favorable conditions, the hurricane rapidly strengthened on the 24th and 25th to peak as a 145 mph (230 km/h) Category 4 hurricane on the Saffir-Simpson Scale. A weakness in the subtropical ridge allowed for a motion more to the west-northwest, and the hurricane to passed about 250 miles (400 km) north of the Lesser Antilles on August 28. For three days during this time, Edouard maintained Category 4 intensity, though weakened late on the 28th due to an eyewall replacement cycle and vertical shear. Late on August 29, Hurricane Edouard developed three concentric eyewalls, an unusual occurrence coinciding with an increase in strength to 140 mph (220 km/h). A mid-tropospheric trough turned the hurricane to the north to an area of unfavorable conditions, and Edouard weakened to a Category 3 hurricanes on the 31st. On September 1, the hurricane passed about mid-way between Bermuda and Cape Hatteras, and turned to the north-northeast. Edouard continued to weaken as it turned to the northeast, and on the 2nd passed about 95 miles (150 km) to the southeast of Nantucket, Massachusetts as an 80 mph hurricane, its closest point of approach to the United States. Edouard weakened to tropical storm status on September 3, and became extratropical shortly thereafter while located to the south of Nova Scotia. As an extratropical storm, Edouard turned to the east, then moved around the periphery of a larger extratropical storm until becoming absorbed by the storm early on September 7. A high pressure system over New England resulted in the possibility that Edouard would track to the west and strike the United States. One computer model predicted the hurricane would strike near Atlantic City, New Jersey with winds of over 111 mph (178 km/h) on Labor Day. This caused Cape May County officials to contemplate ordering an evacuation for the busiest tourist weekend of the year, though an evacuation never occurred. Due to the possibility for a landfall on the East Coast of the United States, officials at the National Hurricane Centre issued Tropical Storm and Hurricane Watches and Warnings from Cape Lookout, North Carolina to Eastport, Maine at various times. Tropical storm warnings existed from North Carolina to Watch Hill, Rhode Island and from the mouth of the Merrimack River to the United States/Canada border, while hurricane warnings existed from Watch Hill, Rhode Island to Merrimack River, Massachusetts. Hurricane watches were also issued for the tropical storm warning area. In North Carolina, Cape Lookout was closed and evacuated prior to the storm's passage. Because a Hurricane Watch existed for the New York City metropolitan area, New York Mayor Rudy Giuliani urged citizens to take preparations. In addition, city officials set up a hurricane helpline, activated the city's Emergency Command Centre at the Police Headquarters, and distributed leaflets to flood-prone areas. Near New Bedford, Massachusetts, where landfall was predicted to occur, schools were prepared as shelters in case of a direct hit. New Bedford Mayor issued a state of emergency for the city. However, few people stayed in shelters during the storm's passage. On Cape Cod, thousands of tourists and summer residents evacuated in preparation for the storm, resulting in an 18-mile (29 km) traffic backup. As a result, many beach resorts lost millions in potential revenue. Of those who remained on Cape Cod, 900 stayed in emergency shelters when the storm passed the area. In Boston's Logan International Airport, numerous flights were cancelled or delayed to move planes to safety. Many sailors removed their boats from the water prior to the storm. At one time in Mattapoisett Harbour, workers removed boats at a rate of one every eight minutes. In Maine, the Red Cross opened several emergency shelters, though they were never used. Like in Massachusetts, sailors removed their boats, and due to media coverage, residents were well-prepared for the hurricane. Despite initial predictions, Edouard's effects were much less than expected. Strong waves struck much of the East Coast of the United States, killing 2 and injuring numerous others. Damage was greatest on Cape Cod, where moderate wind gusts resulted in $4.25 million in damage (2005 USD). In South Carolina, minor beach erosion was reported in Charleston and Colleton Counties. Swells of up to 15 feet (4.5 m), in combination with strong waves, caused overwash on Route 12 on Hatteras Island. Minor beach erosion occurred. Moderate winds of up to 50 mph (80 km/h) blew down a few trees and caused shingle damage to buildings. In Delaware, rough surf closed numerous coastal beaches, while storm tides and waves flooded a campground near the Indian River in Sussex County. Strong waves in New Jersey killed two people and seriously injured another. Lifeguards made numerous rescues along the coast, while other beaches were closed or had restrictions on bathing. Winds were minor along the Jersey coastline, peaking at less than 30 mph (48 km/h). In New York, Edouard produced strong waves and storm tides of 1 to 2 feet (0.3 to 0.6 m), causing overwash along southern Long Island due to high tide. Coastal flooding occurred, including in Hampton Bays where the waves flooded one road and covered another with sand. The flooding trapped six cars, while the strong waves forced several beaches to close. Because the hurricane moved through the New York Shipping Channel, numerous ships reported winds of over hurricane status , though winds remained below tropical storm force on land. A boat capsized off the coast of Jones Beach Island, though its passengers were not injured. A Celebrity Cruises cruise ship suffered damage from 30 to 50 foot (9 to 15 m) waves, injuring several passengers and crew members. Rainfall was minimal, peaking at less than a half of an inch in eastern Long Island. Hurricane Edouard passed about 95 miles (150 km/h) southeast of Nantucket while moving at only 12 mph (19 km/h), much slower than previous New England hurricanes. This resulted in several hours of strong waves, winds, and rain. The hurricane produced wave heights of up to 31 feet (9.4 m), which washed twelve boats ashore and damaged numerous others. The strong waves and a storm surge of up to 2.1 feet (.6 m) in Nantucket flooded a few coastal roads. Edouard also produced tropical storm force winds across much of Massachusetts, as well as one hurricane force gust on Nantucket. In addition, there were unofficial reports of stronger gusts, including 77 mph (124 km/h) on Cape Cod, 80 mph (129 km/h) on Martha's Vineyard, and 90 mph (145 km/h) on Nantucket. The strong winds caused power outages to 2/3 of Nantucket, all of Martha's Vineyard for 6 hours, and most of Cape Cod for several hours. Power outages, effecting 35,000 to 40,000 were reported throughout Massachusetts, though far from the power outages caused by Hurricane Bob five years prior. The winds also downed numerous trees, and blew off the roof of the fire station in Hyannis. Rainfall was moderate from the slow-moving hurricane, peaking at 6.37 inches (162 mm) in West Dennis with many other locations reporting over 3 inches (76 mm). The rainfall produced minor street flooding. Damage on Cape Cod totaled to $3.5 million (1996 USD, $4.25 million 2005 USD). In New Hampshire, the hurricane produced winds gusts of up to 38 mph (61 km/h) and around 1 inch (25 mm) of rain along the coast. In Maine, heavy surf closed several beaches and injured two people. Waves also damaged several boats. Winds were moderate near the coast, peaking at 47 mph (76 km/h) with gusts to 54 mph (87 km/h) at Mount Desert Island. The winds knocked over several trees and caused sporadic power outages throughout the state, including loss of power for 1900 Portland residents. In Kittery, water fell through an office building, damaging computer equipment. Rainfall was minor, peaking at 1.23 inches in Eastport. In southern Nova Scotia, Edouard produced heavy rainfall from 3.7 to 5.5 inches (95 to 140 mm). Winds were moderate, peaking at 75 mph (120 km/h) in Cape Breton Highlands. The hurricane also caused beach erosion on southeastern Nova Scotia. The name Edouard was not retired and was re-used in the 2002 season. It will next be used during the 2008 season.